Businesses should think critically about their brand and how they’re naturally positioned to make an impact. People want companies across industries to adopt policies of corporate social responsibility that protect the wellbeing of individuals, local communities, and the global community. In this report, businesses will learn how they should approach corporate social responsibility, what social issues are important for particular industries, and how public relations firms recommend businesses balance corporate social responsibility and their PR strategies. 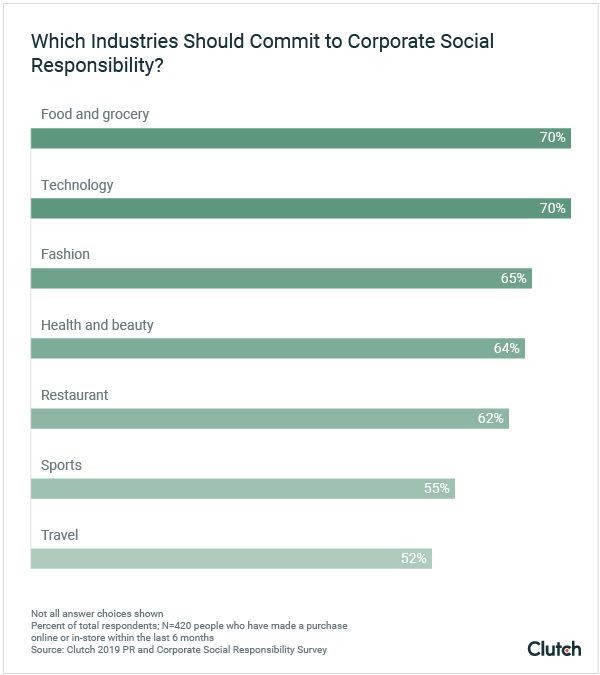 The majority of people say businesses across industries should commit to corporate social responsibility: food retailers (70%), technology (70%), fashion (65%), health and beauty (64%), restaurant (62%), sports (55%), and travel (52%). People expect the technology industry to protect their individual wellbeing and privacy - more than seventy percent of people (72%) say the technology industry should commit to protecting people’s data and privacy. Consumers want businesses to address the needs of the local community; more than two-thirds of people (67%) think that grocery retailers should feed the local community. More than seventy percent of people (71%) say that restaurants should address food insecurity in their local community. People want to know that businesses relying on a global supply chain are not causing harm to people or the environment. More than half of people (58%) think that the fashion industry should use ethically-sourced materials and 53% of people think it’s important for the fashion industry to not use sweatshop labor. Although PR and corporate social responsibility are closely linked, they should be viewed separately. If a company approaches corporate social responsibility from a purely PR standpoint, they risk seeming unauthentic. Conversely, if a company doesn’t consider its brand values or its audience’s values when committing to a social cause, they risk indifferent or negative reactions from their audience. “Corporate social responsibility has PR value, but these programs should not be designed or executed just for PR purposes,” said Jen Bemisderfer, managing director of RH Strategic, a PR agency in Seattle. “Audiences need to believe that businesses genuinely care about the issues that their corporate social responsibility programs address because people want to do business with companies whose values align with their own,” Bemisderfer said. What actions do my customers want? Which issues align with my brand? How am I uniquely positioned to make an impact? Businesses that want to make corporate social responsibility a component of their brand mission must consider their unique audience and abilities. No business is exempt from corporate social responsibility in the eyes of consumers. In fact, people want all industries, from food and fashion to technology and beauty, to make corporate social responsibility a central component of their brand purpose. The majority of people think that all industries should commit to corporate social responsibility, frequently citing food-related industries, such as grocery retailers (70%) and restaurants (62%), as well as the technology (70%), and fashion (65%) industries as those they associate with corporate social responsibility most frequently. Bemisderfer believes the food, fashion, and technology industries rank so highly because they are among the most intimate for customers. The technology, food, and fashion industries may appear to be unrelated on the surface, but share more similarities than expected. Together, they give insight into how connected the world is and how businesses can support individuals, local communities, and the global community. People often sacrifice their privacy in exchange for the convenience and connections that new technologies offer, but they want to know that their personal information is safe. 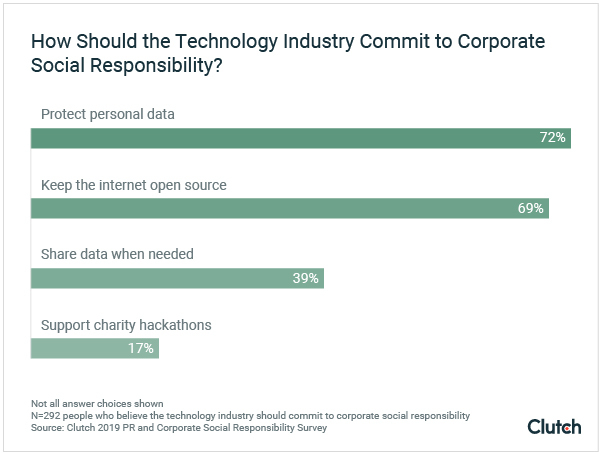 Seventy-two percent of people (72%) who think that the technology industry should commit to corporate social responsibility say that data protection is one of the most important causes it should support. People are concerned about the future implications of giving their personal data to social media platforms, websites, and applications that track information such as geo-location and health metrics. For example, since the 2018 Cambridge Analytica scandal and the associated Facebook data breach, Facebook has been criticized for not respecting users’ privacy and data. Facebook’s ethical missteps are symptoms of much larger issues involving the technology industry and data privacy. Overall, consumers increasingly expect businesses to protect their data and are seeking education to protect themselves. Businesses should pay attention to these consumer demands and implement social responsibility efforts accordingly. 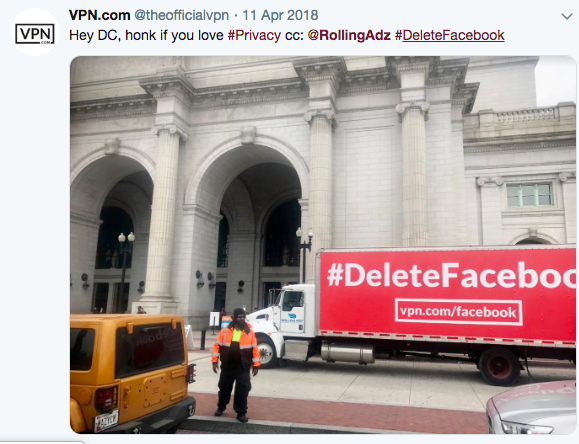 For example, VPN.com launched a campaign that used hashtags such as #DeleteFacebook and #OurPrivacyMatters to increase awareness of issues regarding data protection and privacy. The campaign aimed to educate people on how to properly delete Facebook and how to manage privacy settings for those who were not able to delete it. #DeleteFacebook is still trending as people learn more about how Facebook may be misusing their users’ data. The movement's popularity shows that people care about how the technology industry uses their data and displays the need for more education about privacy settings. 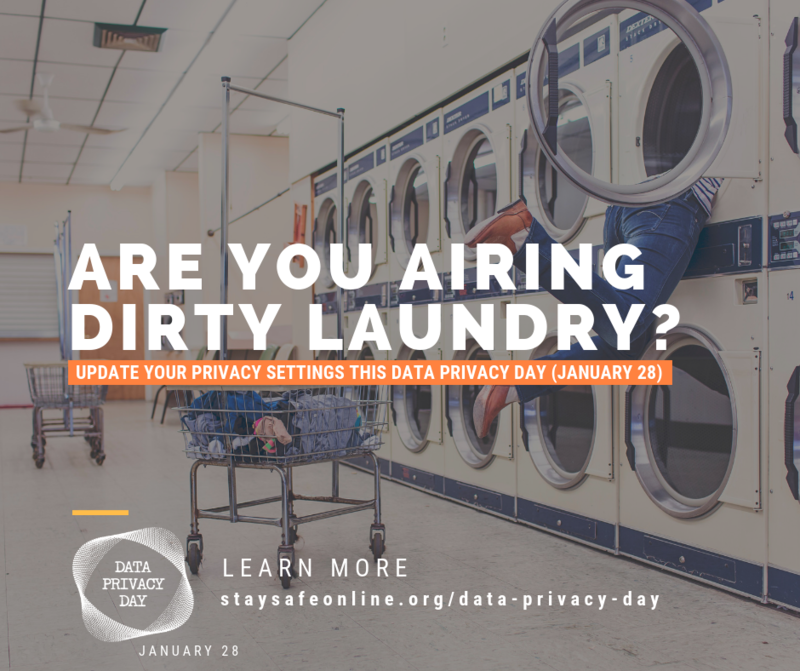 Awareness days, such as Data Privacy Day on January 28, also encourage people to be mindful about what they post online, the information they give to websites and apps, and their privacy settings. Businesses can use campaigns like #DeleteFacebook and awareness days to educate their customers while working with cybersecurity firms to make sure they’re protecting their customers’ data. In the future, more businesses will be expected to uphold data privacy not only because consumers demand it, but because the law requires it. Legislation - like the European Union’s General Data Protection Regulation (GDPR) and California’s California Consumer Protection Act (CCPA) - limits how businesses can use people's data and reflects consumers’ desire for greater privacy protection and transparency from businesses. Businesses, regardless of industry, need to consider how they’re working to protect customers’ personal information. Companies, such as those in the technology industry, should consider how their business impacts individuals and what their customers need most from their socially responsible policies. How a business chooses to approach corporate social responsibility depends on their brand and which issues align with their brand purpose. People find it especially important for businesses in the food industry, including food retailers and restaurants, to give back directly to the local community. 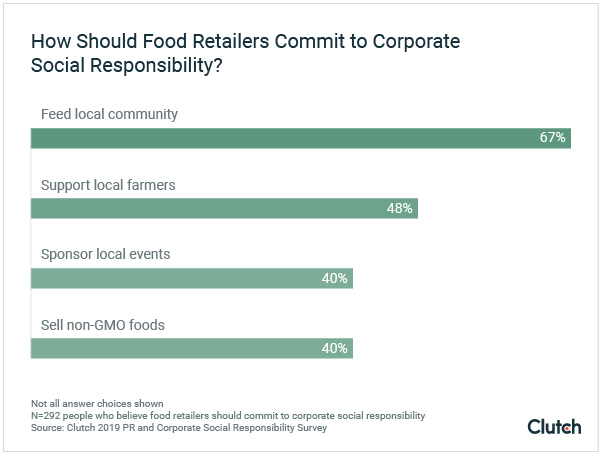 More than two-thirds of people (67%) who say grocery retailers should commit to social responsibility cite feeding the local community as a specific action these retailers should take. 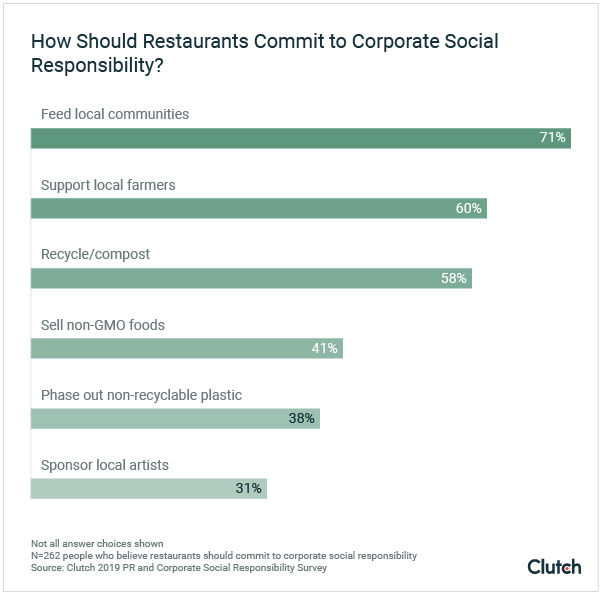 Similarly, 71% of people who say restaurants should commit to corporate social responsibility think restaurants should feed the local community. People see food retailers and restaurants as uniquely positioned to address hunger in their local communities. 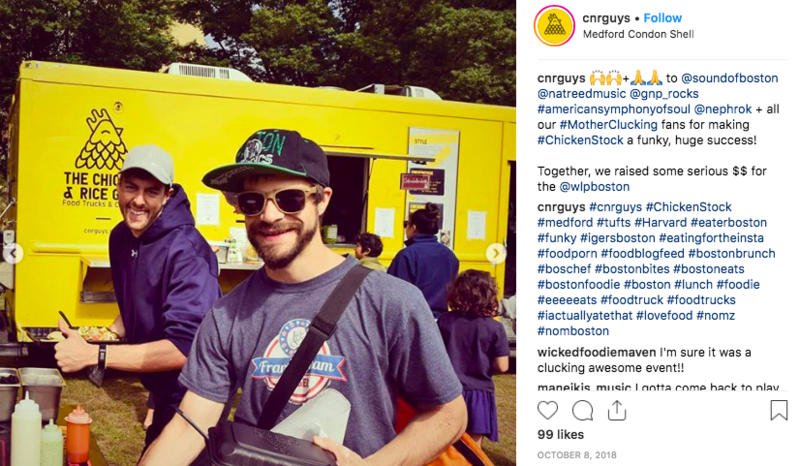 In 2012, four friends started Chicken & Rice Guys, a food truck in Boston. Since then, it has grown into a business that takes chicken, rice, sauce, and corporate social responsibility very seriously. Steve Collicelli, business manager of Chicken & Rice Guys, said consumers now value more than just the cheapest price or best product. Chicken & Rice Guys do simple things to support the local community such as donating surplus food at the end of shifts to organizations like the Boston Rescue Mission, which works to feed the homeless population in Boston. Actions like these are low cost with high impact. As a mobile food truck, the Chicken & Rice Guys saw that feeding the local population was a natural fit for their business. Businesses, such as those in the food industry, should consider which issues or causes are a natural fit for their brand when committing to a corporate social responsibility effort. Businesses’ complex supply chains reflect how connected the world is. The fashion industry, for example, encompasses clothing, jewelry, and accessories, all of which rely heavily on a global infrastructure. 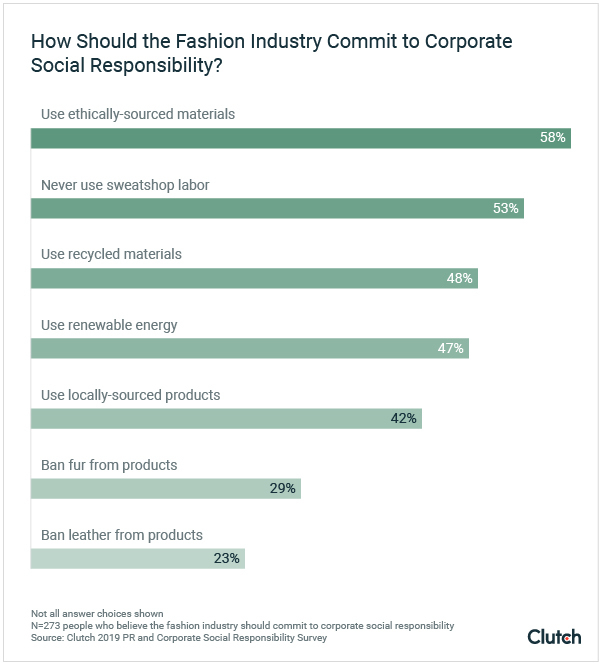 Of those who think the fashion industry should commit to corporate social responsibility, 58% cite using ethically-sourced materials as one of the top actions businesses in this industry should take. Items that we buy are passed through hundreds of hands across different continents before they end up in stores. People care about how these products get into their local mall or boutique. Diamonds, for example, are one of the world’s most valuable commodities: People demand them, and jewelers want to supply them but to do so requires an intensive amount of human labor. Brilliant Earth is among the few fine jewelry companies focusing its brand purpose on corporate social responsibility. The company ensures that their diamonds are ethically-sourced in a way that has not harmed individuals, communities, or the environment. Brilliant Earth goes “Beyond Conflict Free” to show that they exceed the minimum requirements set forth by the Kimberley Process, an international trade initiative that aims to prevent "conflict diamonds" from entering the marketplace. Brilliant Earth supports community development efforts by offering educational programs to help communities around the world. Because their industry is inherently global, Brilliant Earth’s corporate social responsibility efforts consider how they not only impact individuals and the local community, but the wider global community. Businesses, such as those in the fashion industry, should consider the scope of their business and how they can make the most impact, whether on an individual, local, or global scale. The variables that make businesses unique – their industry, brand, customers, and scope – offer unique windows of opportunity for corporate social responsibility. Businesses can approach corporate social responsibility in a way that both preserves authenticity and positively impacts their PR strategy if they consider their industry and brand purpose. “Businesses need to look at what their own brand is and what aligns with their brand. You always want to stay close to the mission of the brand so that it’s an authentic statement and consistent with the brand’s values." It is important for businesses to stay consistent with their brand and adopt policies that make sense for their industry. The Chicken & Rice Guys, for example, saw that as a mobile food truck they were naturally positioned to address local food insecurity. Businesses should also consider what their customers want, which will vary among businesses, even those within the same industry. The technology industry, for example, has been criticized for not protecting people’s personal information. As a result, consumers want the technology industry to commit to protecting their sensitive data and privacy. By getting to know their customers, businesses will better understand which actions they should support the most. This, of course, depends on the company’s scope. Some businesses are naturally positioned to make an impact on a global scale, while others are more naturally positioned to impact the local community. No level of impact is more or less important than another; it simply depends on each business’s scope. Consumers are more aware of how their buying decisions can impact the world around them and expect companies to be socially responsible. Businesses can meet these expectations by considering how they’re uniquely positioned to make the greatest impact. PR and corporate social responsibility are not synonymous, but understanding the best practices of PR agencies can help businesses decide how to approach corporate social responsibility. Businesses across industries, whether technology, food, fashion, or otherwise, can approach corporate social responsibility in different ways to achieve multiple levels of impact. Consumers expect certain initiatives from industries, based on how these industries impact their personal life, local communities, or global communities. People increasingly care about data privacy and want the technology industry to commit to keeping data secure. They also care about the local community and want businesses in the food industry to help address food insecurity by feeding those in need. Finally, consumers care about the global community and want businesses that rely on a global supply chain, like the fashion industry, to pay attention to how they source materials, treat their workers, and impact the communities that host them. Businesses should consider their brand, customers, and scope while building a corporate social responsibility strategy. Clutch surveyed 420 people from across the U.S. who have made a purchase either in-store or online within the last six months. Most survey respondents are male (57%), and 43% are female. Thirty-five percent (35%) are millennials (ages 18-34), 48% are Generation Xers (ages 25-54), and 16% are baby boomers (ages 55+).